Murder by Gaslight: Love, Lust and Murder. Mysterious Affair Near Chillicothe, Ohio—Murder or Suicide—Sad Ending of a Disgraceful Liaison. A special reporter from Chillicothe, Ohio, to-night brings intelligence of a the preliminary examination of John S. Blackburn, charged with the murder of Mary Jane Lovell in Ross county, last week. The case is one of the most mysterious and dramatic on record. Blackburn took the young woman riding along a lonely country road terminating at a ford where two streams merge and then go brawling among wild forbidding cliffs. Here, in a lonely glen, so unfrequented even by domestic animals that the ground was covered with a dense undergrowth of hardy shrubs, Blackburn stated that the girl swallowed poison and flung away the bottle, and by incessant importunity made his kinsman go and seek her dead body. It was found, an inquest held and a post-mortem made, but the actual cause of death remains undetected, as the stomach and its contents were sent to this city for analysis. The evidence to-day clearly proved the criminal intimacy, and disclosed a sickening correspondence, in which Blackburn gave unbridled expression to the most consuming lust. He makes appointments with the girl and stimulates her to promptness with glowing descriptions of their mutual pleasure and hints at rich presents as her reward. These promises are not made good, for she asks for money and nowhere acknowledges receiving any. 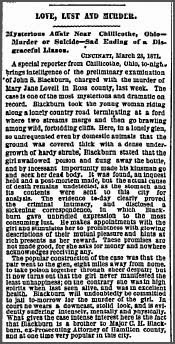 The popular construction of the case was that the pair went to the glen, eight miles away from home, to take poison together through sheer despair; but it now turns out that the girl never manifested the least unhappiness; on the contrary she was in high spirits when last seen alive, and was in excellent health. Blackburn will undoubtedly be committed to jail to-morrow for the murder of the girl. In court he wears a downcast, stolid look and is evidently suffering intensely, mentally and physically. What give the case intense interest her is the fact that Blackburn is a brother to Major C. H. Blackburn, ex-Prosecuting Attorney of Hamilton county and at one time very popular in this city.